When the National Quality Standard was released, I read the support guide cover to cover. The term “each child” jumped out at me. I began to ponder how we were ever going to provide evidence to assessment and compliance officers that we appropriately observed and assessed each child’s learning and development as well as providing an educational program that considered “each” child. Ensuring that each child was considered when developing the educational program became a significant challenge and one that appealed to the list maker in me. I love a good checklist, spreadsheet or form that needs to be filled out so I quickly set about developing a range of tools that would ensure that each child was being observed across all developmental domains and that these observations were being used in the development and planning of learning areas and structured times within the learning environment. With traditional observation and documentation methods, there was constant need for cross-referencing to ensure that all learning areas were observed and reported upon for each child. Analysis of the observations entailed examining data across a folder’s worth of paper and at times seemed never-ending and incredibly complicated. More than once I have found myself confused at my own checklist and spreadsheet and wondering where on earth I had put an observation that has been recorded but is now missing! Documenting learning links in traditional documentation is also complex and requires linking across a variety of document types in various locations. With Kinderloop, all of these complex links, analysis and consideration in programming and planning became so simple. With all the data in one place and searchable, I found myself no longer missing observations and not even really needing my spreadsheet to ensure equality across the children in my care! Linking observations to the program and learning outcomes became as simple as adding a tag to a post. Developing the educational program with consideration for each child became a matter of simply looking up a specific group and the tags within. The best part about this new form of documentation is that it is completely customisable, each educator within the learning environment can use it in a way that makes the most sense to them, altering and adding new tags, creating different groups and adjusting analysis and assessment of learning within the comments section. 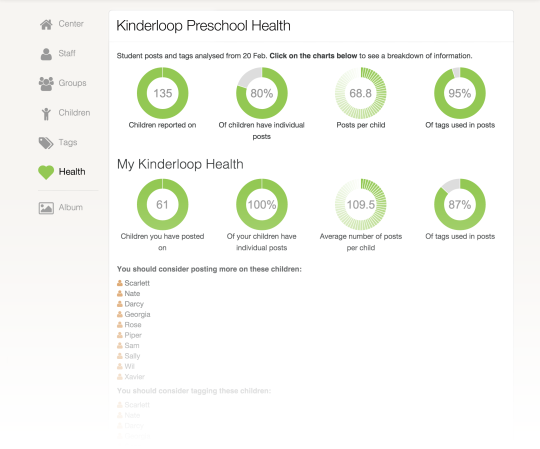 Then came the ultimate checklist: Kinderloop health! This amazing feature is a statistic loving educator’s dream come true. This feature gives you a run down of how many posts have been made per child, who may need a few more posts, which learning outcomes are the most popular and which need to be examined a bit more. It is possible to see at a glance the number of posts for children within the entire centre and within an individual educator’s observational group – no more spread sheet, no more checklist; everything you need in one place for ease of assessment, analysis and linking! As everything is located centrally, for assessment and rating or spot check it is easy to share information with assessment and compliance officers. It couldn’t be more simple to ensure that “each” child is being considered in the development of the learning program and that it this achievement is documented for assessment.